2. A metal bar perforated for screws applied to a fractured bone to maintain the ends in apposition. 3. The agar layer within a Petri dish or similar vessel. 4. To form a thin layer of a bacterial culture by streaking it on the surface of an agar plate (usually within a Petri dish) to isolate individual organisms from which a colonial clone will develop. 5. Any of the horizontal perforated plates that make up the fractionating component of a column in fractional distillation (or, the theoretic equivalent of such a plate). 1. a flat structure or layer, as a thin layer of bone. 3. to apply a culture medium to a Petri dish. 4. to inoculate such a plate with bacteria. bone plate a metal bar with perforations for the insertion of screws, used to immobilize fractured segments. dental plate a plate of acrylic resin, metal, or other material, which is fitted to the shape of the mouth and serves to support artificial teeth. 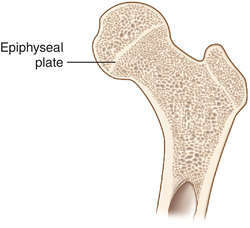 epiphyseal plate the thin plate of cartilage between the epiphysis and the metaphysis of a growing long bone. floor plate the unpaired ventral longitudinal zone of the neural tube. 2. the embryonic precursor of a foot. hand plate a flattened expansion at the end of the embryonic limb; the precursor of the hand. motor end plate end plate. neural plate the thickened plate of ectoderm in the embryo that develops into the neural tube. roof plate the unpaired dorsal longitudinal zone of the neural tube. tympanic plate the bony plate forming the floor and sides of the meatus auditorius. 1. Dentistry A thin metallic or plastic support fitted to the gums to anchor artificial teeth. 1 a flat structure or layer, such as a thin layer of bone or the frontal plate between the sides of the ethmoid cartilage and the sphenoid bone in the fetus. 2 a single partitioning unit of a chromatographic system. Orthopedics Flattened orthopedic hardware with multiple holes for screws to stabilize fractures. See Blade plate, Buttress plate, Compression plate, Neutralization plate, Pressure plate Reconstruction plate. 1. anatomy A thin, relatively flat structure. 2. A metal bar, perforated for screws, applied to a fractured bone to maintain the ends in apposition. 4. To form a very thin layer of a bacterial culture by streaking it on the surface of an agar plate (usually within a Petri dish) to isolate individual organisms from each of which a colonial clone will develop. 5. Any one of the horizontal perforated plates that make up the fractionating component of a column in fractional distillation (or, the theoretic equivalent of such a plate). 2. An incorrect reference to a full denture. 3. A shallow covered dish for culturing microorganisms. 4. To inoculate and culture microorganisms in a culture plate. In the embryo, the upper (dorsal) half of the neural tube (above the sulcus limitans). The bony roof of the external auditory meatus. A metal, steel, or aluminum plate that has one or more slots in it, designed to weave a rope through, to create friction with a carabiner. In dentistry, a plate made of some suitable plastic material into which the patient bites in order to have a record of the relationship between the upper and lower jaws. The device may be reinforced with wire and used as a splint in the mouth or to treat temporomandibular joint difficulties. A flat, round or oval decalcified bone or metal disk, employed in pairs, used in approximation. The fetal surface of the placenta. 1. The thin, perforated, medial portion of the horizontal plate of the ethmoid bone; the olfactory foramina are passages for the olfactory nerve. 2. Alveolar bone, the spongy bone that makes up the wall of the socket for a tooth; found in the maxillae and mandible. An old term for the denture base of metal or acrylic material that rests on the oral mucosa and to which artificial teeth are attached; by extension, incorrectly used to mean the complete denture. One of two prominences of the notochord in the embryo. The thin layer of cartilage between the epiphysis and the shaft of a bone. Growth in length of the bone occurs at this layer. The platelike mass of chromosomes at the equator of the spindle in cell division. A flat, floor-mounted instrument, similar to a scale, for determining weight-bearing loads and biomechanical forces placed on the foot during walking or running. It is used to detect subtle body movements in order to identify postural deficits, or to develop (in athletes or people with balance disorders) more fluid and safer coordination and locomotion. A photostimulable image detector used in computed tomography in place of x-ray cassettes. It gathers the energy from x-ray photons on a layer of phosphor that can repeatedly store and release information in digitized form for enhancement, recording, and image display. The central portion of the ectoderm in the embryo developing into the neural canal. In the somite, the myotome from which the striated muscles are formed. A thickened band of ectoderm along the dorsal surface of an embryo. The nervous system develops from this tissue. The part of the palatine bone forming the dorsal half of the roof of the mouth. In some cells, the flattened platelike bodies seen at the end of the spindle during mitosis. Either of a pair of thin, bony processes that arise from the sphenoid bone. They are termed medial and lateral pterygoid plates on each side, serve to bound the infratemporal fossa, and give origin to muscles of mastication. A device that moves fluids in a specific direction. The dense connective tissue structure that supports the eyelid. It was formerly called tarsal cartilage; however, it is not true cartilage. The bony plate between the anterior wall of the external auditory meatus and the tympanum. 1. [TA] In anatomy, thin, relatively flat, structure. 3. Agar layer within a Petri dish or similar vessel.